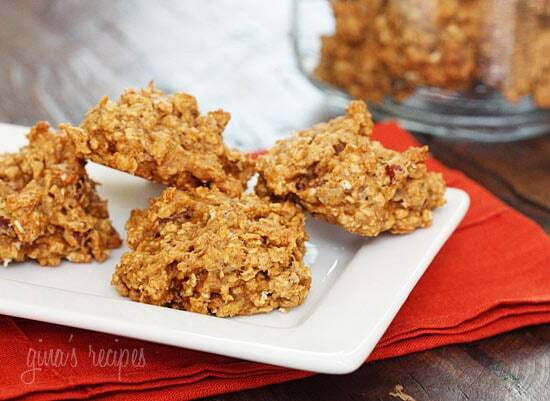 Pumpkin Spiced Oatmeal Pecan Cookies – For the pumpkin obsessed! 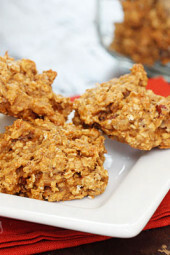 Chewy, low-fat oatmeal cookies made with quick oats, pumpkin, spices, and chopped pecans. A few of my other pumpkin infused desserts are Pumpkin Chocolate Chip Cookies, Pumpkin Hazelnut White Chocolate Biscotti, Pumpkin Butterscotch Bars, Pumpkin Spiced Snickerdoodles and No-Bake Pumpkin Spice Cheesecake. I think the photo below says it all. My 21 month old had a taste of these cookies before I started photographing them, and later as I was taking my photos, her cute little hand kept getting in my set trying to steal my cookies. I know lots of you love the Fall and all the pumpkin goodness that comes along with it. I’ve been stocking up on cans of pumpkin for future recipes, so stay tuned! Pumpkin is a little hard to find right now, but soon it will be everywhere. I found canned organic pumpkin in the organic market by me, it was a bit more money but I don’t mind spending extra for organic. 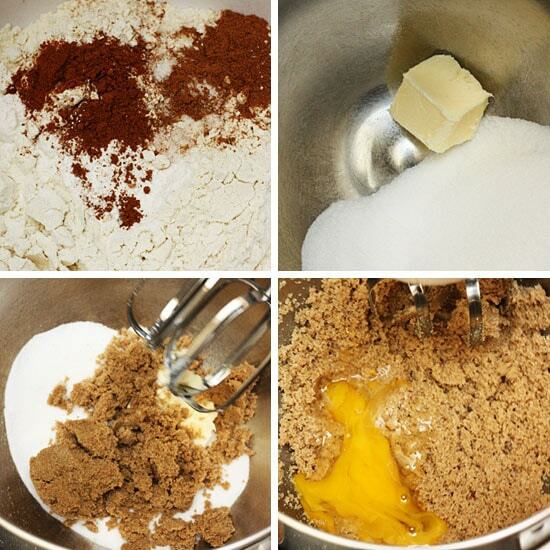 In a medium bowl, whisk together flour, oats, baking powder, baking soda, salt, pumpkin spice and cinnamon. Add the egg, followed by the pumpkin and vanilla extract. Working by hand, stir in the flour mixture and the oats until just combined and no streaks of flour remain; stir in the pecans. Drop 1 tablespoon of the dough at a time onto prepared baking sheets. Cool on baking sheet for 3 or 4 minutes, then transfer to a wire rack to cool completely. Makes 32 cookies, 1 tbsp each. Just pulled the first batch out of the oven. Yum! Yum! I've made three batches of these cookies in five days, and I'm not even sorry. 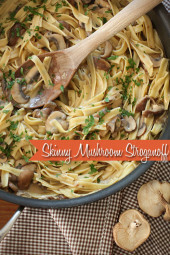 This may be one of the best Skinnytaste recipes I have ever made! These were delicious – thanks for another great recipe! 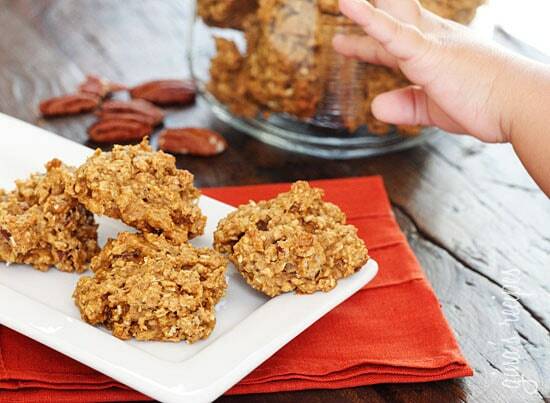 I made mine without pecans, since I am not a big fan (down to 122 calories per 2 cookies!). I also had no parchment paper and found that aluminum foil sprayed with some cooking spray worked fine as well. These are great. I used old fashion rolled oats and added cinnamon chips. l love your recipes. One of my favorite for apple season is the apple cranberry crumble. Just made these and they came out great. Thanks for the recipe! Thanks, Gina! These were A-mazing! I also made some without nuts and some with nuts and mini chocolate chips. They are delicious. I just made these with a couple of modifications; first I don't usually have regular brown sugar so I used organic coconut palm sugar with a bit of raw sugar because I did't have enough of the palm. I also used 1/3c pecans and 1/4c mini chocolate chips. I must have made mine much smaller than yours, I got 44 cookies. So the points + count is 3pts/2cookies. And delish!! I also just made the pumpkin banana bread into muffins and added mini chocolate chips instead of pecans. Yummooooo also!! Love your recipes and your site. Thanks for sharing!! I have made these cookies several times and even my pickiest eater loves them! My family grabs them in the morning for a quick breakfast treat. I used walnuts and I added a few chocolate chips once. 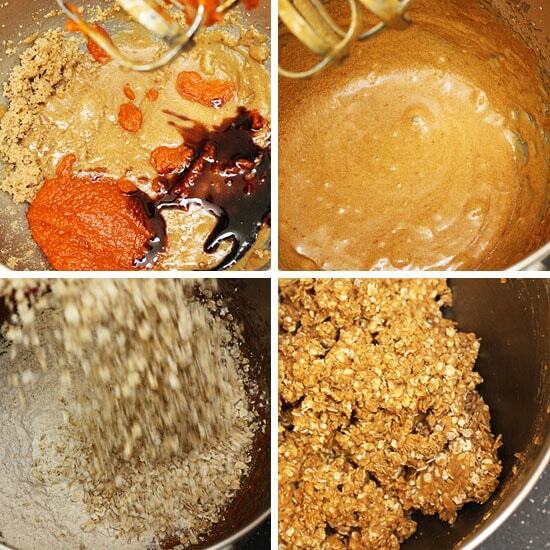 No matter how I make them, the base of oatmeal and pumpkin make them delicious. I forgot to mention that baking is not my best strength, but even I can do these. I look forward to trying more of your recipes. They are easy, healthy and delicious – all things I can get on board with. These were delicious! I added chocolate chips to a few cookies and they were even better. My warning: you might need to increase the baking time by several minutes. These are great – hearty & not too sweet. Yum! The flavor was good . Not sure what went wrong but we tried . Can I use your pumpkin butter for this? I have made quite a few of the main dishes and side dishes on this website, and so far, all have been winners. I made these cookies yesterday, and while they have a good taste (I subbed golden raisins for the pecans), their texture is not what I was expecting. To me, they are more cake-like than chewy, and they didn't flatten out at all. Agreeing with another comment, the edges didn't brown so I wasn't sure when they were done properly. Maybe my timing was off. They're not bad, just different. i was wondering if you could use the pumpkin butter recipe that you have in place of the canned pumpkin? do you think that you would need to add more flour to substitute? these sound really yummy none the less and i will be making them. Thanks!! I just popped some in the oven! I used chocolate chips in place of the pecans, cant wait to try some! I don't have oatmeal on hand, could this still work? apparently I'm in the minority, but I just ate the first cookie I pulled out of the oven a few minutes ago, and I found it to be rather dry. I think diced apples would be a good addition that wouldn't ruin them for people who are looking for a reasonably healthy treat and would make them much more moist. How do I count the calories for these? 165.2 kcal per serving or 165.2 kcal for 16 servings? thanks in advance! Seriously? Do you really think 32 cookies would be only 165 calories? I am so looking forward to making these cookies tonight with my husband. This is such a nice one for the start of fall ,and into Thanksgiving. I just love Pumpkin Madness. Thank you for all the great Reciepe's . Oh my gosh, so delicious I have already made them twice. First time I used pecans, walnuts, almonds, pumpkin seeds, and sunflower seeds to equal the original 3/4 cup of nuts. (Gotta love the bulk food department!!) They were delicious! These are FABULOUS! Tastes just like fall and such a great treat for a reasonable calorie count. Thank you! Considering a can of Libby´s pumpkin puree costs almost 3 euros here, I choose my recipes carefully – and these cookies were a winner!!! Thanks Gina – I am looking up more recipes on your site to use up the rest of the pumpkin now!! These are crazy delicious. I brought them into work, and everyone requested that I make them again. So yummy! My daughter and I made these cookies last night. They are easy to bake and they taste good. She took them to school today in her lunch and they were also a hit with some of her high school friends. I'm going to try the pumpkin butter recipe tonight. I absolutely love skinnytaste! Just made a batch of these and am eating one warm right now. These are great!!!! Thanks for the recipe. 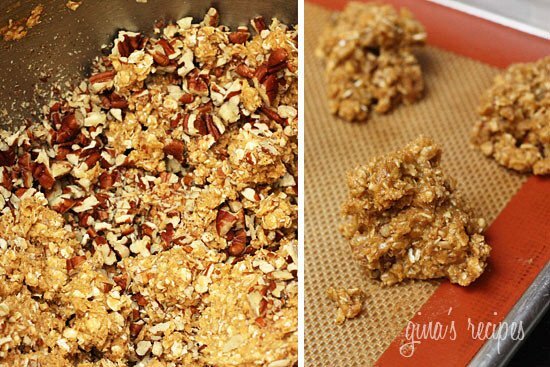 Gina – would gluten free oats work with this recipe? Also, what flour could I substitute for the all purpose flour? Thank you. made these today and they are definately a keeper, i omitted the butter and instead used 2 tbsp organic coconut oil, put oatmeal thru food processor, everyone loved them, Thanks for a great recipe!! Oh. My. Gosh. I just died and went to pumpkin oatmeal cookie heaven! These are AMAZING… Keep up the great work! I can't wait to try more of your pumpkin recipes! What are "quick oats"? I can never find that in the grocery store and am DYING to tries these immediately. I can't get enough of pumpkin. You should be able to find them in any grocery store, along with "old fashioned oats." Quick oats are chopped up smaller so that they'll plump up into oatmeal if you just pour hot water on them, as opposed to old fashioned oats, which you need to cook for a few minutes. I've generally found them to be interchangeable in baking recipes, though I'll use what's called for if I happen to have both. Hi Gina…..just wondering if using jarred baby food in pumpkin would work in place of pureed pumpkin?? I just made your oatmeal chocolate chip cookies last week….Thank you very much!! Love them! They re so delicious! SOOO GOOD!! I used coconut oil instead of butter, skipped the nuts, added shredded coconut and dried cranberries. The kids LOVE them. (Also was able to cut the sugar to a litter more than 2/3 cup and they were still loved by all!) 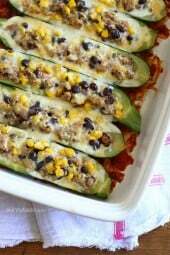 Would love to try these with almond meal). Thanks for the recipe. I made these today, took the suggestion of decreasing pecans to 1/2 cup and added 1/2 cup of semisweet chocolate. YUMMMMMMMMMM! I made these today, took out 1/4 cup of nuts, and added 1/3 cup of mini dark chocolate chips. They are phenomenal! I got my name on two of them, with a big cup of coffee. It's nice to enjoy fall flavors before Spring gets here! I have a lot of pumpkin left over from making the breakfast smoothies (yummy and filling). More than enough to make more smoothies and then some. Anyhow, decided to make these cookies and was in a mood to bake. I didn't have all of the ingredients, but what is cool about your recipes is how easily I can make substitutions. No eggs-used 1/2 banana. No brown sugar-Used 3/4 C white with a little molasses. I also used whole wheat oats. I was a bit nervous…but they turned out great even though they have more of a banana taste. I think I'll be making this every couple of weeks from now on. Thanks Gina! I was craving something sweet yet healthy today and I knew just where to look for a delicious recipe. I didn't have the nuts but they came out excellent just the same with raisins. Thanks as always for your incredible recipes. Very tasty. Followed recipe, but must have used a bigger scoop because I only yielded 20 cookies. 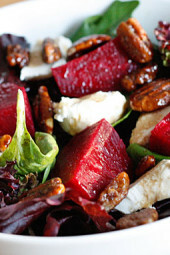 Plan to make these again and want to try it without nuts and with diced apple instead. I made these today with a few changes. I used applesauce instead of butter. Just a straight substituation, 2 tablespoons for 2 tablespoons. I also used a little more canned pumpkin, almost a half a cup altogether (just because I wanted to use up what I had leftover in the fridge from the pumpkin cupcakes I made last week). The cookies still turned out wonderful! They look just like the picture even with the substituations! Does anyone know what the points would be without the butter? i know this is an old comment, but i just calculated the nutritionals with applesauce in place of butter and it came out about 20 calories less. so i don't think the points would be much different – if different at all! I needed to use up some bananas, and found your pumpkin banana bread recipe. And since I had a can of pumpkin open, I decided to make the Pumpkin Spiced Cream Cheese and these super-delicious-can't-keep-my-kids'-hands-off-these-cookies to finish up the pumpkin. Thanks for helping me great, healthy treats for my family! JUST pulled these out of the oven and oh my goodness they are de-lish! Shared this over on my Fizzy Party Facebook page. Yummy!!! Can this recipe be made ahead of time and refrigerated or frozen before baking? Jenn, I don't want to guess, you may want to plug it into recipe builder to see. what would the point difference be if I took the nuts out completely? I'm sorry, I don't have that info, and I don't want to guess! you will have to plug it into a calorie recipe builder such as my fitness pal or one of those sites. Can you tell me how much of the fat is saturated? 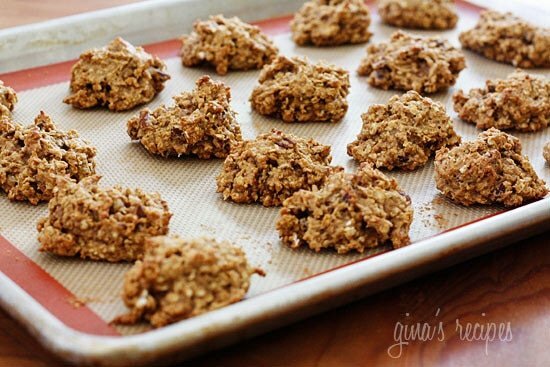 I made these Glutien Free by substituting 1 c brown rice flour + 1/4 tsp xanthum gum. Pumpkin Perfection! My husband is not a fan of GF baking but LOVES these. My 3 year old's hands are also constantly sneaking up on my plate. Thank you. No pumpkin, so nuked a small sweet potato instead and found a recipe for making the pumpkin pie spice online. Then used half a bag of dark chocolate morsels with just a few pecans. They are the best!